On January 19, the Toronto Port Authority (TPA) announced its own makeover. The TPA, in a move reminiscent of putting lipstick on a pig, is now known as PortsToronto. 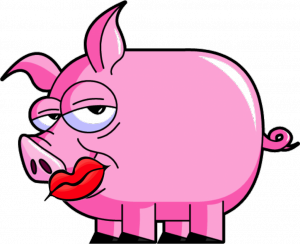 To put “lipstick on a pig” , according to Wikipedia, is a rhetorical expression used to convey the message that making superficial or cosmetic changes is a futile attempt to disguise the true nature of a product. In the case of PortsToronto (formerly known as the Toronto Port Authority) the outfit seems to be indicating that it needs to change its name for better, more positive recognition. To appreciate what PortsToronto, formerly Toronto Port Authority, is attempting to undertake, it’s important to understand branding. Two definitions give an indication. One is from the American Marketing Association (AMA). The other is from online businessdictionary.com. The business dictionary goes further. Branding is “The process involved in creating a unique name and image for a product in the consumers’ mind, mainly through advertising campaigns with a consistent theme. Branding aims to establish a significant and differentiated presence in the market that attracts and retains loyal customers. 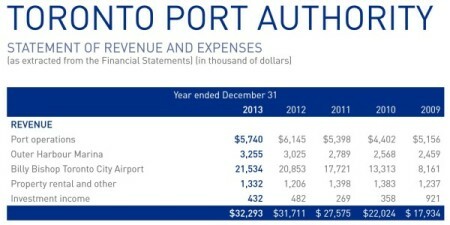 So why is the Toronto Port Authority rebranding? On the face of it, the whole TPA branding or rather rebranding exercise seems unnecessary if Ispos-Reid polls taken from 2012 to 2014 have any credibility. The public, including customers of PortsToronto’s Billy Bishop Toronto Centre Airport and Outer Harbour Marina, have voiced consistent recognition of the important economic benefits the institution provides the city. At least that’s what Ipsos-Reid says. Perhaps PortsToronto, concern over the 8% drop in those who agree on its economic importance prompted the institution to act. Perhaps an analysis that showed the weaknesses in the institution’s claim and subsequently spooked it into rebranding. It’s difficult to see what direction PortsToronto is moving in other than airport expansion. For example, the institution’s Statement of Revenues and Expenses from its 2013 Annual Report shows growth in only the airport revenues and even that’s stalled, with the graphic below showing a $681,000 increase in 2013 over 2012 – a feeble effort given the $3 to $5 million annual increase in previous years. No wonder the institution is betting the farm on airport expansion. As for port operations, Census Canada’s last document on shipping in Canada was in 2011 That was before the Harper government emasculated the agency. 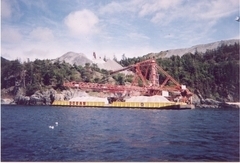 It shows that Toronto was 36 out of 50 in total tonnage loaded and unloaded with 1,797.8 million tonnes, just ahead of Beale Cove with 1,576.3 million tonnes. Perhaps PortsToronto intends to follow a different set of priorities, one that has members of its board of directors respecting rules for federal appointees and one that has its administration be more forthright with the public. On December 4, 2014 Trinity-Spadina MP Adam Vaughn, during question period, cited PortsToronto board chair Mark McQueen for donating to the party whose leader, Stephen Harper, appointed him to PortsToronto. On December 12, 2014 MP Vaughn exposed another board member, Colin Watson, for the same infraction. 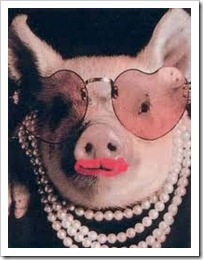 Stephen Harper re-appointed Mr. Watson to the board and in turn Mr. Watson gave money to Mr. Harper’s party. As if to emulate certain board members’ behaviour, the administration seems to think it quite alright to ignore certain facts. The ‘Corporate Responsibility’ section on its website says this about the environmental assessment it’s conducting. In presenting the EA information as if it were a PortsToronto initiative, the administration failed to mentioned that the city council passed a motion requiring an EA for airport expansion. Indeed, the announcement ignores the purpose of the runway extension. It also conveniently ignores council’s requirement that PortsToronto agree to passenger caps before the city considers the EA findings. Funny how the press release states that PortsToronto has “the expressed desire to have the organization work collaboratively, transparently and in partnership”.